MANILA, Philippines - Jhayron Malayao, 12, died of drowning after plunging into Pasig river from Jones bridge on Thursday, February 18 at around 5pm. 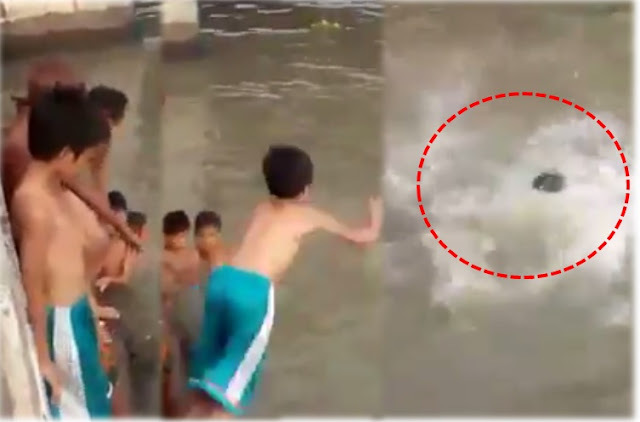 A Facebook video shared by netizen Bartome Hadikain revealed the unfortunate turn of events after a group of young boys pressured each other to jump from the bridge into the river. Each of the four boys in the group boldly took the plunge from the high bridge to the deep waters of Pasig river. When it was Malayao’s turn to jump into the river, the young boy showed hesitation as to whether he should go for the dive. But due to peer pressure, Malayao, who appeared too scared to jump, soon found himself doing the dare as he jumped from the lower portion of the bridge. But unlike his friends, Malayao didn’t emerge from water after jumping. His pals tried to search for him, but Malayao’s lifeless body would only be found a day after, floating along the river in Tondo area. Employees of Manila International Container Terminal were the ones who discovered his body. happened yesterday at around 1700H at jones bridge..hanggang ngayon di pa din nakikita ang katawan nang bata na naka blue ang short after tumalon sa ilog..
As of press time, the video of the incident has spread like wildfire on social media getting almost 1.5 million views and more than 21,000 shares. In November 2015, a Manila Electric Co. (Meralco) employee lost his life after drowning in Pasig river. Jose Mari Del Rosario, a 27-year-old driver, lost control of the Toyota Vios vehicle he was driving along J.P. Rizal Street in Guadalupe, Makati. As a result, his vehicle swerved and plunged into the river. Unable to escape the sinking vehicle, Del Rosario died of drowning.